Hong Kong’s only rewards programme that benefits both your business and employees. Receive additional coverage with the Cathay Elite Corporate Card insurance for baggage and personal possessions. Baggage that is lost, damaged or stolen whilst on business travel with a common carrier will be reimbursed up to HK$40,000. The Cathay Elite Corporate Card guarantees protection against fraudulent transactions on your Card, provided responsible care has been taken and as long as we are notified immediately after discovery of any fraudulent transactions, in compliance with Card Terms and Conditions. American Express SafeKey11 further enhances online transaction security with added security measure to safeguard your online purchases. 7. Annual Card Fee: American Express will waive the first year annual Card fee. 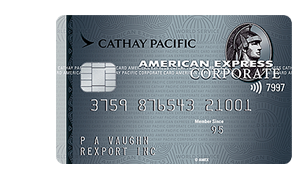 The American Express Cathay Pacific Elite Corporate Card annual fee is currently HK$590 per annum. American Express will waive the next annual fee if your spend in the previous year is HK$400,000 or more per Card on the Elite Corporate Card.